The Tagliolini made with eggs from "La Monfortina" express the full flavour and essence of the Langhe Hills and represent only a taste of the wide range of traditional products this pasta maker offers. 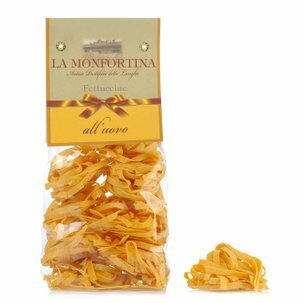 With the full flavour of fresh pasta, they are perfectly paired with red Piedmont wines, such as Barbera and Dolcetto. Ingredients DURUM wheat semolina, fresh EGGS 24%. ALLERGENS: cereals containing gluten (wheat), eggs. For more information on product labels, please contact our Customer Service department. The information on the labels of the products may vary for reasons beyond our control, therefore, there may be discrepancies between the information on the site and that on the products delivered. Please always check the information on the product before consumption or use. 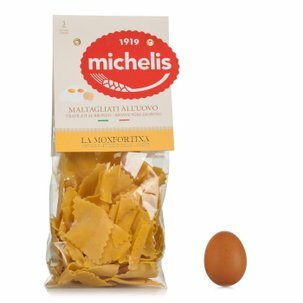 "La Monfortina", located in Monforte d'Alba (CN), prepares its tajarin and pasta made with eggs according to the tradition of Langa. 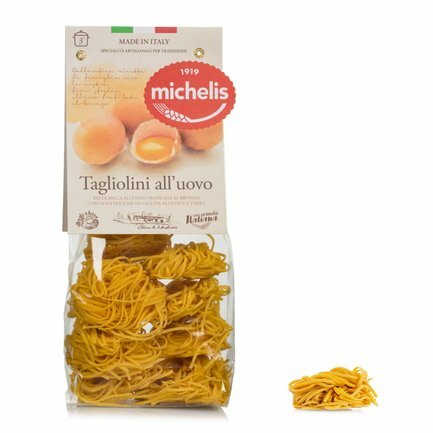 The pasta dough is made using only fresh eggs, it is then cut by hand and left to dry naturally for 24 hours.